Q: I have a fish only freshwater tank and need to lower my pH. I am afraid to use Discus Buffer because it contains phosphates. What should I do? A: Phosphate is nothing to be concerned with in a fish only system. Phosphate concerns are a ‘carry over’ from reef keepers where even a small amount of phosphate can present problems for many corals. It is really an insignificant property in freshwater systems unless it is a planted tank with a very intense lighting system. If you are still concerned about phosphate causing algae problems in a fish-only tank, rest assured that phosphate in itself does not cause algae; algae requires light that is in the blue spectrum for photosynthesis. Standard aquarium light is weak in the blue spectrum and strong in the red range and does not easily support algae growth. This makes the colors on fish seem brighter. It also makes brown fish look more red. Q: What do I do if Discus Buffer makes my freshwater tank cloudy? How do i clear it up? A: The cloudiness you experienced is caused by the precipitation of excess calcium and magnesium. In excessively hard water, the precipitation could cause a clouded or chalky hazed appearance. To clear this, you can use a water clarifier (flocculate) as they tend to work fast and are available at most aquarium shops. You could also wait for this precipitate to fall out of solution on it's own (fall to the bottom of the aquarium) but this would take considerably longer than using a flocculate. You can also use a fine mechanical filter (floss or micron) to catch these particles. Q: Should Discus Buffer not be used at all in planted aquariums? I was told it would be ok.
A: Discus Buffer (phosphate based) is OK to use in a planted aquarium but bicarbonate based buffering systems are generally more accepted in planted aquariums as to not introduce any excess phosphate. You can achieve a bicarbonate based buffering system with our Alkaline Buffer and Acid Buffer. Q: I am interesting use Discus Trace, but I just wonder what is the difference between Discus Trace and aquarium salt. Can I mix them in the tank? A: Common aquarium salt (sodium chloride) is used to impact the density of the water making it harder for parasites to equilibrate to the denser water. Some fish do not mind this therapeutic use of salt, and some fish do mind it. Discus are a fish that will not tolerate this elevated level of sodium in the water. If you keep live plants in your discus aquarium, the plants will not tolerate this either. 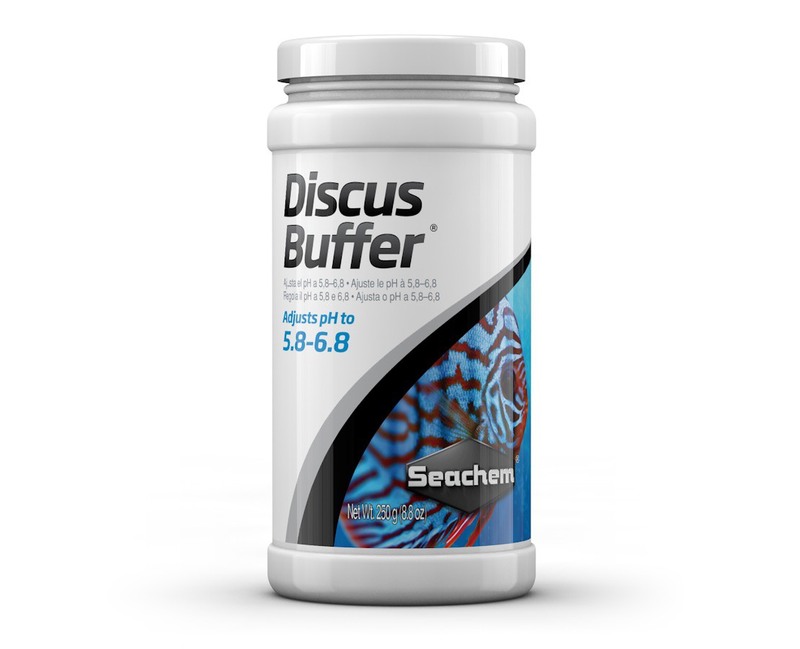 Discus Trace is a well rounded trace mineral supplement that does not contain sodium and is used to replenish trace and ultra trace minerals that are demonstrated to be necessary for fish health and growth.